OZAT socket design is clearly superior to most other sockets available. Their state of the art electro-chemical machining process makes it possible for OZAT to produce all of their sockets in the less-stress™ configuration illustrated below. 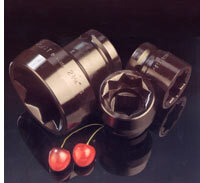 Without these special machining capabilities, cost of producing the preferred less stress sockets becomes prohibitive. Manufacturers who use the normal broaching method to achieve the hex pattern in their sockets, may have to compromise in the selection of suitable steel, OZAT is able to specify the most perfectly matched material from which to manufacture the most durable and reliable sockets available. The OZAT difference results in longer socket and fastener life and cost savings to the user.